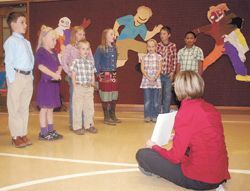 Bondurant Elementary School students sing ‘Down by the Bay,’ which they wrote for the Sublette County School District #1 board, family and friends at the board’s annual meeting in the small school Thursday night. Pictured are (left to right) Gavin Keelin, Taylor Coleman, Aedian and Declan O’Connor, Grace Walker, Finley O’Connor, Banks Walker and Erik Rivera. Seated, teacher Missy Davis holds posters with the verses. Not pictured: Wyatt Peters. Photo by Joy Ufford, Sublette Examiner.